Life abounds with stress-making, havoc-provoking mayhem. Did you misplace your keys when you were already late for work this morning? Was traffic worse today than after a 5-car accident on a Los Angeles turnpike? Is your boss expecting the impossible from you, while you stare into your kid’s eyes and choke back tears explaining you’re going to have to miss their game–again? In these moments, you need a fast, effective method to chill the heck out. 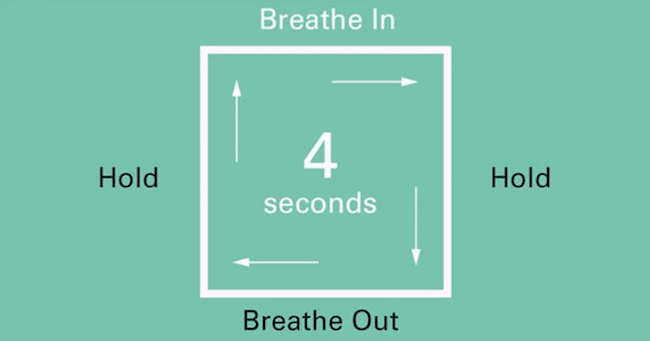 This simple exercise can calm you down and eliminate stress in three minutes or less. The best thing about this breathing technique is that no-one will even know you’re doing it. It is used by first responders, Navy Seals, and people who are regularly under massive amounts of stress because it has a direct, palpable, and positive effect on the way their nervous systems function. If you were to pick someone up in an ambulance from one of those LA traffic pile-ups, you don’t have time to freak out. Maybe they won’t live. You have seconds sometimes, to make smart choices that could possibly keep them breathing long enough to get them to a hospital. Every fiber of your being has evolved over time to signal danger. This is part of your body’s fight-or-flight response. When faced with danger or any perceived threat, you instinctively default to two choices: Run or fight. A cascade of chemical reactions occurs the minute a stressful situation presents itself. This is how the body mobilizes its resources to deal with a threat. It doesn’t matter if it is a lion about to pounce on you–as our ancestors had to deal with–or that one last email that finally breaks you. Your natural response to stress will be the same until you learn how to interrupt it. The sympathetic nervous systems will trigger the adrenal glands to release catecholamines, which include adrenaline and noradrenaline. This causes your heart to pound, your blood pressure to rise, and your breathing rate to speed up. Your pupils may dilate, and your skin may flush. In extreme stress, your muscles tense up–literally preparing you to run away from the dangerous trigger. Modern-day triggers are so varied and pervasive, we are almost never in a state of calm. After a stressful event, it can take up to 45 minutes for your body to return to homeostasis. That’s why a simple breathing exercise can literally save your life, and retrain you to face stressful situations like a seasoned, meditating monk instead of a raging lunatic. Breathwork is in fact, so useful, that one study published in the Journal of Alternative and Complementary Medicine in 2017 found that patients with major depression who practiced deep breathing methods for three months had significantly reduced symptoms as compared to those who did not. Another study found that our breathing is so closely linked to our emotional state, that changing it can practically negate anxiety completely. Sometimes called box-breathing, you can really use any form of deep, present and conscious breathing to change your physiological response to stress. An exhale that is longer than your inhale (deep breathing) causes the vagus nerve which runs from the neck down through your diaphragm to relay a message to your brain to turn down your sympathetic nervous system and turn up your parasympathetic nervous system–the part of your nervous system responsible for rest, relaxation, peace, and digestion. This counteracts the adrenal dump and flight-or-fight response. Your brain is freed to make smart choices based on relaxed concentration, a state known as Alpha that is seen on EEG scans as neural oscillations in the frequency range of 5–12.5 Hz arising from synchronous and coherent (in phase or constructive) brain activity. Alpha waves caused by a deep-breathing pattern create a positive feedback loop that restores harmony between your mind and body. This brainwave state is also indicative of those ‘aha’ or ‘eureka’ moments of a compelling new idea, or insane creativity. They allow you to literally create something out of nothing. And when do you need to do that most often? When you are faced with a challenging or stressful situation! You can start with a box breath and expand into larger inhale-exhale ratios. A box breath is a simple inhale to the count of four, using your diaphragm. You then exhale for a slow count of four. Be sure you expand your lungs completely, and fill them as much as you can. If your shoulders are shrugging into your ears, you are likely doing a ‘stress-breath’ which only keeps you in the fight-or-flight stage. This is a shallow breath that we normally do when we are agitated or depressed. Your stomach should expand, not just your lungs. This is because your diaphragm is moving down into your belly to allow your lungs to expand more fully. Once you can do this, you will change the ratio. You will start with a 4:8 inhale to exhale ratio and then move to 8:16, 10:20, 22:44, or even 30:80 etc. You don’t have to be advanced to get all the benefits of deep breathing. Simply have enough awareness to take control of your breath the next time a stressful situation arises, and you’ll be feeling less anxious, and calmer. It’s that simple. You can breathe yourself into peace, in three minutes or less.